Additional modeling properties when generating datasets. User defined name of the relationship. It is also used as the identifier of the relationship. User defined name of the table. It is also used as the identifier of the table. User defined name of the column. Int64.MaxValue and Int64.MinValue not allowed. Double.MaxValue and Double.MinValue values not allowed. NaN not supported.+Infinity and -Infinity not supported in some functions (e.g. Min, Max). During data loading we quantize values with day fractions to whole multiples of 1/300 seconds (3.33ms). Currently allows up to 128K characters. Property indicating if the column is hidden from view. Default is false. User defined name of the measure. "formatString": "0.00 %;-0.00 %;0.00 %"
You can try creating a new dataset without writing any code at: http://docs.powerbi.apiary.io/#reference/datasets-preview/datasets-collection/create-a-dataset. The new dataset is current only available in preview. It can be accessed at https://api.powerbi.com/beta/myorg/datasets. Please leave any feedback at http://community.powerBI.com. When pushing rows to a table in Power BI, you will receive a 200 OK response when the rows are successfully loaded to Power BI, and some error status code when they are not. However, what about those rare cases when you don’t receive a response at all due to some network or timeout issue? Should you push the data again? Before now, there was no way to know. Now, with sequence numbers, you always know what state your data is in. Sequence numbers are assigned to a set of rows that you are pushing. If you are unsure if the previous call succeeded, send with the same Sequence Number and we’ll determine if the call is a duplicate or not. 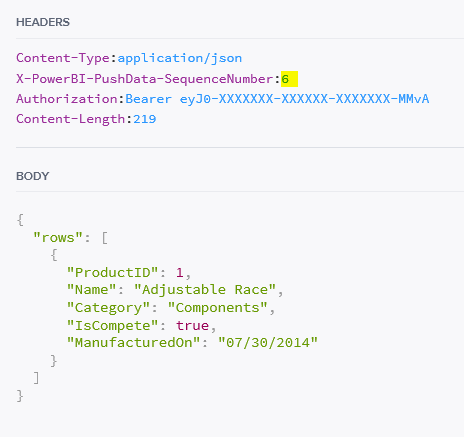 Try the API now at: http://docs.powerbi.apiary.io/#reference/datasets/table-sequence-number. The above approach works great if you have a single device or client pushing to a table in Power BI. However, if you have multiple devices or clients pushing to the same table at the same time you can add the “X-PowerBI-PushData-ClientId” header and a client ID to maintain a separate sequence number for each client. Use of this header is optional. Sequence numbers are support in both the v1 and beta versions of the API. To try all the APIs mentioned in this article, please visit: http://docs.powerbi.apiary.io. For more information on developing for Power BI, see: http://dev.powerbi.com.